I have often felt that the legendary British stiff upper lip, at least insofar as the dealings of many British governments with their colonies are concerned, is kept so by a determination to prevent the truth, or an acknowledgement of the fundamental immorality of their situation, from ever coming out. But thank God for the Internet. It all started with the cold war, that interesting non-conflict of elephants whose victims were the field mice who had no interest in the conflict. No, actually, it did not. It started with the slave trade and colonialism and using human beings as farm animals. Let us traipse lightly across the decades, though, because we all have at least a general idea of what happened during that time. The <?xml:namespace prefix = st1 ns = "urn:schemas-microsoft-com:office:smarttags" />US wanted a military base, and the Brits had islands to lease. 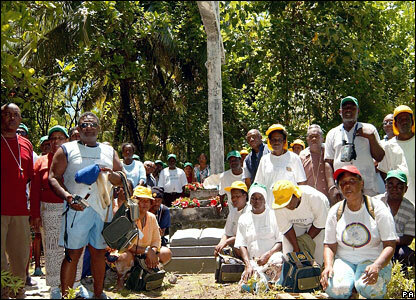 The US cast its covetous eyes on Aldabra Island, near Madagascar. But there was a hitch. The island was the breeding ground for rare giant tortoises. We all know how our liberal friends and ardent conservationists can get when animal habitats are threatened. The powers that be did not want conservationists making heated pronouncements about tortoises or elephants. People are much more likely to take note if a moth, a tortoise or a fruit bat is in danger. They are less likely to worry about the eviction of a few blacks, especially if public opinion is shaped to view them as a few savages recently settled on prime land. So the Chagos Islands were chosen. Between 1967 and 1973, two thousand islanders were moved to Mauritius, where they now live, except for a hundred or so settled near Crawley in England. The islanders got British citizenship, a development viewed by some as better than going to the Christian heaven. This measure that gave them citizenship, the Immigration Ordinance<?xml:namespace prefix = v ns = "urn:schemas-microsoft-com:vml" /> of 1971, gave the Brits the legal backing to allow the US to build its bases on Diego Garcia, the biggest of the Chagos islands. The US used their military base for warmongering, as expected. They used it in Gulf War I, Afghanistan, and Gulf War II. Fancy dispossessing people so their land can be used as a springboard for killing more people! The islanders bless them, have not sat and moaned. They have fought the British government in British courts. The British government, as most former colonies will tell you, can be a formidable adversary. Indeed, the Crown may be doing something that - if she only knew the true position - she would prefer not to do, and yet it is then said that the Government can hide behind the Crown's prerogative. Time passed. In 2000, the British government first lost its case in the High Court. The government then said that a feasibility study needed to be conducted prior to allowing the islands to return. What kind of feasibility study do you need to return to people land that you stole from them? American authorities, however, expressed the concern that if Diego Garcia were returned to its owners, their security would be in danger (no paranoia there!). So the British government, once more preferring the friendship of the most powerful to the human rights of the less so, did an about turn and marched smartly backwards to its previous position. The island was not to be returned. People could not live on Diego Garcia. But in May this year, the High Court decided that it was “repugnant ” to exile people like that. We saw that with the Falkland Island or Las Malnivas, depending on whose side you are on. Political observers think that it bodes well for small peoples struggling against strong and soulless governments. I agree. Many of us have become cynical about our ability to influence things that may cause us harm and even death. People feel that governments are uncontrollable and are too lethargic or terrified to even attempt the task. Shall we then give up and let them mess us about? Shall we accept our imposed role as pawns in the games of nations and power blocs? No. Ants are tiny things, but anyone who has ever been foolish enough to attack a column of driver (or “soldier”) ants knows that when acting in concert, small animals can be very dangerous. Besides, silence is consent.